Watch the video of Hugo Chávez's while in custody during the coup. NOTE: These videos are in low resolution, but they are long; therefore, it may be easier to right click on them and select "save target as," then save them to your computer before viewing. What is this? This is the video taken by the Venezuelan military on Saturday, April 13th at the Turiamo Naval base in North Central Venezuela. Chávez has now been in custody for more than 24 hours. The soldiers in the video have come to transport Chávez to Orchila Island where he will take a plane to Cuba. The audio is difficult to hear so at the bottom of this page, I have added transcripts in English and Spanish. Why is this Important? This video is important because Chávez is discussing how he ordered Plan Avila on April 11th (a plan that would have called out the army to stop the opposition march). He explains how ordering Plan Avila fractured the military high command and precipitated the cascading collapse of the government. 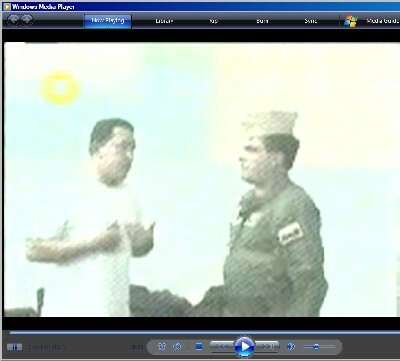 Also note that in this video Chávez says that it was not ONLY Generals Manuel Rosendo and Efrain Vásquez Velasco who refused the order (men who were latered villified as conspirators), but also Chávez's good friend and ally, General Lucas Rincón, a man who would remain in the Chávez government after the coup. This supports the idea that the generals disobedience came from principle, not from a desire to oust Chávez. While it is certainly true that many in the military wanted Chávez out, the seminal decision to disobey was not made by Chávez's enemies, but by his closest allies, by men who had been handpicked for their loyalty, yet who finally decided that Chávez had gone too far.None of these generals wanted to be the one responsible for massive human rights violations like those committed the last time Plan Avila was implemented in 1989 which resulted in hundreds of civilian deaths. They also knew that Plan Avila violated the 1999 constitution (only the National Guard is authorized to maintain civil order). The president's tone here is also important: As you watch the video take note of how the president depicts Generals Rosendo and Rincón not as conspirators, but as "cowards" for not having the gumption to follow his commands. Chávez's rendition of his conversation with General Rincón is particularly important because it shows Rincón trying to stall and weasel out of implementing the order, ultimately telling Chávez, “It isn’t convenient.” Again, even though Rincón refused to implement Plan Avila, he was kept in the government after the coup. Chávez still considered him loyal and eventually made him the highest ranking officer in the army and the Minister of Defense. While Chávez does describe Vásquez Velasco as a "traitor," this is likely more for his role in pushing Chávez to resign on April 12th, than his refusal to answer Chávez’s calls on April 11th. It should be noted that several months after the coup, in August 2002, the Inter-American Human Rights Commission (part of the Organization of American States) ruled that the government had to change Plan Avila in order to be compliant with human rights standards. The video is also important because Chávez says that he did not resign. He is resistant to being transported--insisting that he is still the president--but that if he goes, he wants to go to Cuba. He explains how he turned himself over to the military on the morning of April 12th in order to avoid further blood shed. At the end of the first segment of the video, he acquiesces to the officers and allows them to take him to Orchila. In both videos we see that Chávez is being well-treated while in captivity. In the first video he mentions how they let him go jogging around the base and in the second video we can see a nurse giving him eye drops and some medicine for his acid reflux. This belies the narrative of his captivity that Hugo Chávez would later invent where he claimed that his captors tried to assassinate him upon his arrival at the Turiamo base (a plot Chávez told Larry King in 2009 was ordered by the CIA). Of course, I can certainly understand why Chávez would fear for his life while in captivity and especially when transported to a distant military base, but there is no evidence of a plan to kill him. 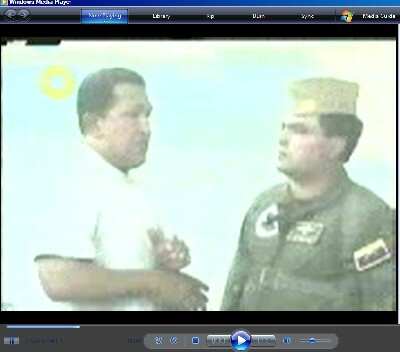 In fact, the first thing they did to Chávez when he arrived at the base was give him a medical checkup--which is why he is getting the eye drops and some medicine for his acid reflux in the second video. Transcript of dialogue in Spanish (partial): My description of the video from "The Silence and the Scorpion." Chavez: yo le estaba diciendo al capitán que salió, Sosa, yo hasta ahora no he preguntado ningún abogado, me encomendé a Dios y dije ojalá que un rayo de buen juicio les llegue a los que están tomando decisiones, me voy dejé mi fusil y mi pistola...no he preguntado...no he hablado ni con mi mamá, ni con mi esposa, estoy incomunicado, pedí un abogado, me dijeron que no, solo aquí me vieron toda la noche... bueno lo cierto es que yo, llegó un momento que yo necesito que me digan a donde voy a ir sino yo no salgo de aquí. Chavez: ahora coronel, fíjate una cosa, yo estoy incomunicado...y tengo un temor…yo si me voy a Cuba, o a donde yo decida, no puede ser obligado, Cuba sería una posibilidad que yo he estado evaluando antenoche, pero no hubo capacidad de oir a nadie, el ansia de poder se adueñó de todo y creyeron que, ya llegamos y Chávez está listo, pero aquí mucha gente no sabe todavía ,no entendió nunca que yo no soy uno... esa Constitución 82% y eso lo patearon, y yo incluso, para que tu sepas, propuse esa noche, lo decidí, el general Raul Baduel me dijo ´no te rindas´ y todo el alto mando me traicionó, ¡cobardes y desleales!, yo ordené en la mañana aplicar el Plan Avila, yo tengo potestad para hacerlo, cuando me enteré por órganos inteligencia de las mismas Fuerzas Armadas y la DISIP, de la Fuerza Armada, de que el plan insurreccional estaba en marcha y que el general Medina Gómez, el agregado de Venezuela en Washington estaba aquí y trajo armas…de toda esa vaina me entere yo…y ordené, ante tantas evidencias, ¡Plan Avila general Rosendo!, pero el general Rosendo no quiso…se me desapareció…¡Lucas, Plan Avila!…"presidente no se que, vamos a pensarlo"… ¿qué vamos a estar pensando?, Plan Avila"…"bueno voy al Fuerte Tiuna"…"bueno está bien vete al Fuerte Tiuna pues" …entonces allá…"no que, no es conveniente"…entonces agarré un radio que yo tenía y empiezo a buscar la red y agarro a García Carneiro comandante de la brigada…le digo "García Carneiro qué está pasando? "…"coño mi comandante no se, a mi me están buscando para meterme preso"…"¿quién chico""…" los generales"..."¿cómo que preso, qué pasa? "…"bueno que hay una insurrección militar"…entonces le digo, "bueno mira, entonces yo estoy al mando, mándame los tanques para acá, vamos a hacer Plan Avila"… trancaron la autopista, los Próceres, trataron de evitar, sin embargo los tanque salieron. Si ellos hubieran cumplido…mire la historia señalará responsables…si el alto mando militar hubiera cumplido con la orden que yo di de aplicar el Plan Avila en la mañana de ese día, que ya yo tenía todo y ellos también, de que veía ese plan insurreccional…lo que pasa es que algunos de ellos estaban comprometidos con el general Vásquez Velasco ¡traidor! Ese se escondió…lo mandé a llamar a Miraflores y se escondió…lo mandé a llamar con el capitán, el ayudante, y me dijo "mi comandante el general no se, se metió en la habitación y no responde" ¡es un cobarde!…y ese es el que tienen ustedes de jefe. “The boys have taken marvelous care of me since I arrived!” Chávez said with a big smile. “They are tremendous soldiers, good people who have given me all that I need, including good conversation. I just finished jogging for a little bit and I was…” As he spoke, he shook the men’s hands, patted them on the shoulder. He was trying to keep up the smile as best he could, to play the role of the president, the commander-in-chief, but it seemed forced, not quite right. All the soldiers were in uniform except Chávez who was wearing shorts and a white t-shirt. Even in dress, Chávez seemed out of place. The head of the new officers, a colonel, tried to say something—“Well, I’m very glad…”—but Chávez kept talking. “Yes,” the colonel began, “look, first I have been commissioned to take over your custody in every regard—your security—and the intention is to take you to Orchila for your, uh, possible subsequent trip out of the country.” There was a pause. Chávez nodded, but it was plain he didn’t like what the Colonel was telling him. Orchila was another naval base, an island in the Caribbean about 150 miles off the coast, a place where the top naval brass liked to vacation. It was true that there was an airstrip there, so it was possible to take a flight to Cuba. But could he trust these men? Was it a trick? Maybe they would get him on the chopper, kill him, then throw his body into the ocean? “Those are the orders that they gave me,” the colonel added. Chávez brought the tips of his hands together, thinking. “Now Colonel,” Chávez said very slowly. “Fijate una cosa,” consider this, he said, “I am incomunicado. I have this fear. I...if I go to Cuba, or wherever I decide, because I can’t be forced to go...Cuba could be a possibility, [one] that I have been considering since the night before last, but I haven’t had the chance to talk to anyone. The thirst for power has taken control of them, and they thought, ‘We made it! Chávez is done!’ But there are a lot of people that still don’t know….They don’t know anything about me and...” Chávez paused, uncertain again. He changed direction and pointed to the table where he had a copy of the constitution. “That constitution, 82 percent of it, they have trampled on and I, myself, so that you know, I proposed that night, I decided [to turn myself in]. General Raúl Baduel said to me, ‘Don’t give up,’ and all of the high command betrayed me. Disloyal Cowards!” Chávez shouted, shaking his fist. Suddenly, the words were coming fast as Chávez’s fears and frustrations began to pour out: “I ordered Plan Avila in the morning—I have the authority to do it—when I was informed by the intelligence community in the military and the DISIP that an insurrection was underway and that General Medina Gómez, Venezuela’s [military] attaché to Washington, was here and that he had brought weapons! “‘Uh, Mister President, I don’t know,’ [he told me.] ‘Let’s think about it,’ or some such thing. “What is there to think about? Plan Avila! “‘Okay, fine go to Fort Tiuna then.’ So once there [I called him]. The Colonel tried to be patient as Chávez spoke. It was not his place to cut Chávez off nor did he want to upset him; he didn’t want to do anything that might make Chávez hesitate about getting on the chopper. As usual, once Chávez started talking, it wasn’t easy to get him to stop. Chávez clasped his hands in front of his waist. “Te entiendo, I understand chamo, forgive the commentary...but consider this: at this level I could refuse to go, okay? Why? Because according to the constitution I am the president of this country.” He placed his hand on the Colonel’s shoulder and was now speaking in an intense whisper to emphasize his point. More, Chávez was testing his limits, seeing how much he could influence these men. “So just let me sit here, I’ll eat my lunch, after lunch I am going to meditate a little to help me make a decision.” The colonel nodded—letting the defunct president finish his lunch seemed a reasonable request. “But if I am under arrest, then fine,” Chávez went on, “then I will stay under arrest here. I am not obligated to go. The night before last, yes, in order to prevent what I knew would happen...this.” Chávez then told the Colonel how a tank commander in Maracaibo—10 hours from Caracas—had said he would help Chávez but that Chávez told him to stay put. Again the Colonel reiterated that his mission was only to transport Chávez to the Orchila Naval base. “Please permit me to fulfill my mission,” he said. Then he went on to say that Chávez would be safe, even saying that he would protect Chávez’s life with his own if necessary. Chávez would go with them. What else could he do? Chávez, of course, had told the colonel that he needed extra time to finish his lunch so that he could finish his note. But in the end they didn’t leave him alone again, so the letter went unfinished, hidden in the trash. Chávez soon forgot about it. He didn’t really think it was likely that the corporal would be able to come and get it anyway. And even if the did, who would he give it to? Turiamo was a very isolated base. They didn’t even have telephones or fax machines. After lunch Chávez changed into blue jeans and an olive drab tee shirt. Then the nurse gave him some medicine—some pills for his cholesterol, medicine for his upset stomach (acid reflux), and drops for his eyes. The rumble of the waiting helicopter could be heard outside. People were coming in and out of the room now—the flight crew, other nurses, gawkers who wanted to catch a final glimpse of Chávez—the famous Hugo Chávez—before he left Venezuela forever. He made sure he greeted all of them. When one officer came to the door, Chávez greeted him with a wave and a shout. “Epa! What’s up?” Then half-heartedly Chávez said, “I haven’t resigned.” He said it with a smile and without conviction, as if it had become a joke and that no one was taking him seriously anymore. Soon the colonel and his aide returned. They discussed the trip and when Chávez might leave Orchila for Cuba—tomorrow morning. Chávez nodded and asked a few questions. He was still trying to woo them and complimented the Colonel’s aide. “I should make this one my assistant,” he said pointing to the man and laughing. “He knows how to get things done, boom, boom, boom.” Chávez began to gather up his medication, then, oddly aware of how he was kissing up to them, he said, “I’m developing ‘prisoner’s syndrome,’” and went on to explain how captives often develop close relationships with their captors. Then he was out in the sunshine and quickly into the helicopter. Soon they were airborne. Despite the roar of the engine and the open doors, Chávez continued talking to the other men, chatting them up. General Medina Goméz insists that he was not involved in a conspiracy against Chávez. The General has said that he was aware of a growing conspiracy in the military and that the Chávez administration was also aware of it. Like General Vásquez Velasco, Medina Goméz believed that Chávez was letting the conspiracy “run its course” so that he could use it as an excuse to purge the military of his opponents. See Meza and La Fuente, El acertijo de abril, P. 65. “After being placed under arrest... extra time to finish his lunch.” This anecdote about the letter comes from two seperate tellings by Hugo Chávez: 1. Chávez, Hugo, “Entrevista Especial al Presidente Hugo Chávez Frías con Greg Palast,” VTV, Caracas, 15 May 2002. 2. Chávez, Hugo, “CADENA NATIONAL—RESTITUCIÓN DE PODERES” VTV. 14 Abril 2002.